Our iBuild program offers dog owners the opportunity to transition their dogs from tethered or chained settings to the flexibility of a yard. Moving a dog from a chained life to one in a yard reduces bite potential and other risks associated with chaining. It also increases options for both dogs and their owners for richer, more frequent interactions. The program opens a connection between dogs and pet owners where there may not have been one before. 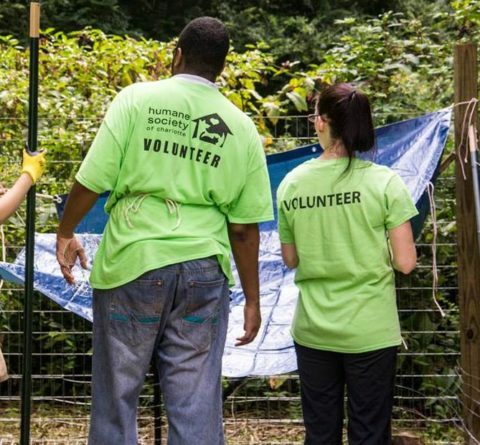 It also lets the Humane Society of Charlotte serve as a resource for the fence as well as for other needs that may be helpful to the human/animal bond. 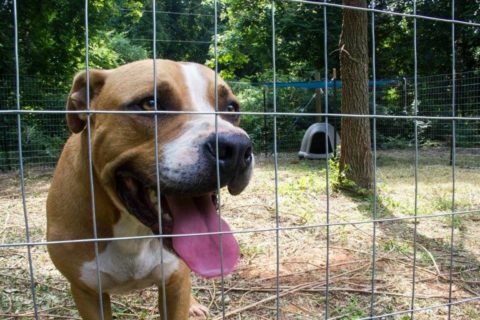 This may include access to spay/neuter, behavior counseling, enrichment programs, and tools to transition a primarily outdoor dog to living inside. It’s not uncommon for families in this program to eventually transition outdoor dogs to indoors. Volunteers are the key to making this program work. We accept the generous help of both our regular volunteers and groups who come to put up just one fence. Businesses, clubs, other animal welfare organizations, universities and a variety of other organizations have helped! The program focuses on areas of Charlotte where there’s an identified need for access to pet resources. These areas typically also lack access to many human services, have low incomes, and struggle with a high rate of human-food insecurity. These focus areas often have higher volumes of Animal Control concerns and complaint calls. Our strategically planned work helps reduce the number of dogs going into the shelter system. Our work can increase options for pet owners, introducing them to additional programs that HSC offers such as our Community Cat Project, Pet Food Bank, Critter Care Wellness Clinic, Spay/Neuter Clinic, and even our Volunteer program. To make a donation to our HSC iBuild program, click here. To volunteer as an individual for iBuild, click here. • Dog(s) must be altered, vetted, microchipped & wear an I.D. • The area will remain clean and clear of feces, trash, tree limbs, etc. The surgery, vaccine, microchip and medical costs will be covered by our Spay It Forward fund. These funds are restricted to supporting the lower income population with their pet needs. Are you interested in donating towards a fence build project? Please make a gift today!